I am playing along with this week's Make it Monday #348: Lotsa Letters with my first card. I was also inspired by the Throwback Thursday post where the Heart cover plate was featured. 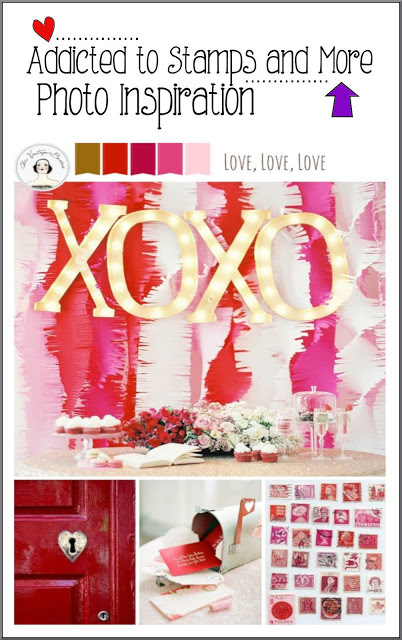 The colors I used were inspired by brighter versions of conversation heart candies. I am also entering this card at Addicted to Stamps and More #325, where the photo on the bottom right has rows and columns of little Valentine's Day items, and the Sisterhood of Snarky Stampers #127: V is for Valentine. 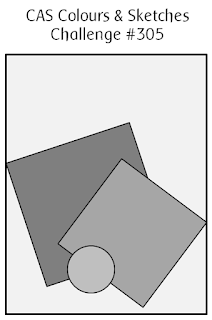 SSOS is a new challenge for me, and I'm not sure if my card is too nice or not snarky enough? My next Valentine's Day card is inspired by the sketch at CAS Colours & Sketches #305. 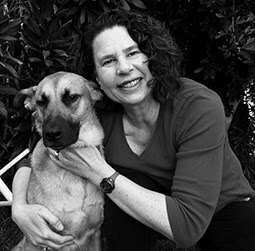 I paired up a puppy from ME Puppy Play with the dog house from Paper Smooches. I can't remember where I got the Darice paw print embossing folder, but it's been in my stash for a while. 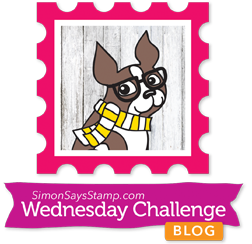 I am also entering this card at Simon Says Wednesday challenge: Have a Heart. 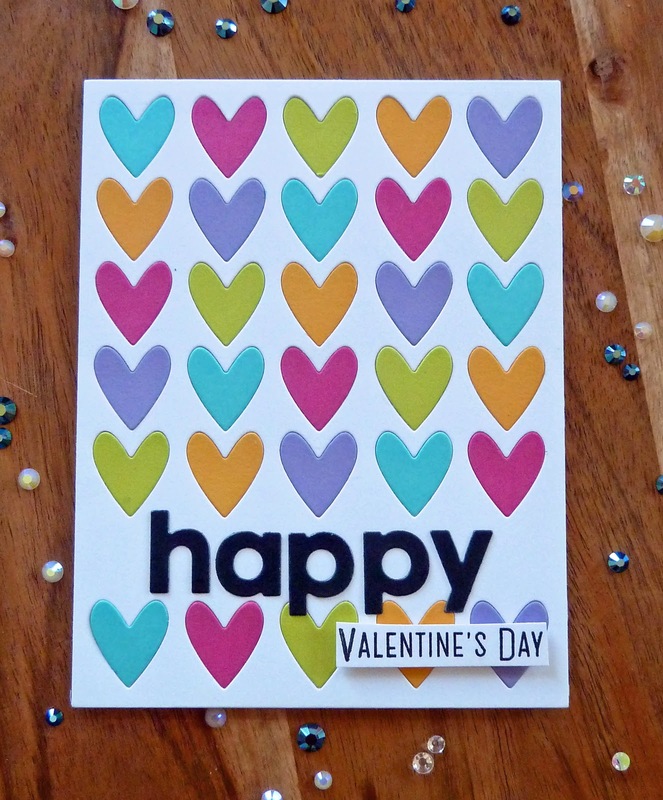 Lovin' all of those colorful hearts and those cute embossed paw prints! These are adorable Joyce! I love both your cards. 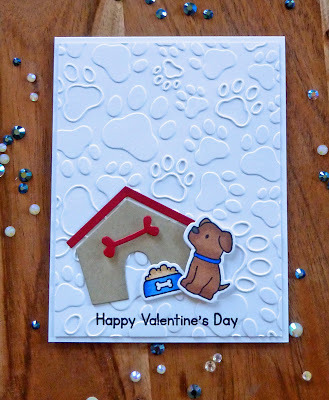 Those colourful hearts are stunning and the dog card is really sweet - I love that embossed background. Snark is optional at SOSS - we do love to see some but it's not always easy to include, especially on a Valentine's card! fabulous couple of cards, love the designs of both. That pawprint embossing folder is so cool and the hearts card just perfect with all those wonderful colours. Rather fun to see the color variety on the first card. Card #2 is so complete with the embossed background. oh my...so much cuteness on your post today. Love your sweet puppy card and those hearts on your first card are fabulous and fun! Thank you so much for playing along with us at ATSM! 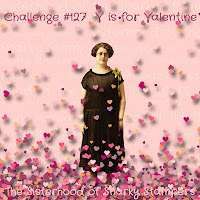 Like Jane said - snark is optional at the sisterhood...we are so glad you played along! 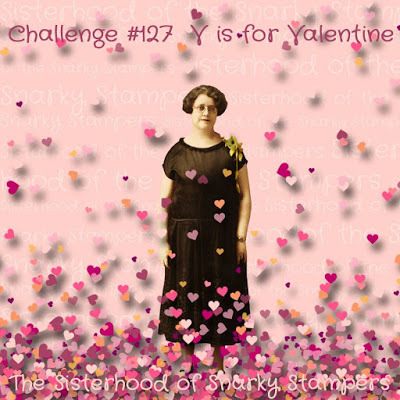 Thanks for being Valentines with Edna and the sisterhood of snarky stampers! Cute take on the sketch! The embossed background is perfect. Thanks for joining us this week at CC&S! Two very different cards, Joyce, but wonderful valentines. What a darling dog card, thanks for playing along with us at CC&S. I LOVE LOVE these cards!!! Thank you for joining CC&S challenge! Love this--such happy and bright colors. That makes up for it not being snarky ;-) Thanks for joining us at SOSS! 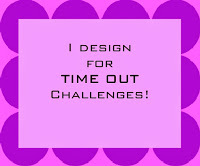 Even I couldn't manage to put any snark on my card for this challenge! 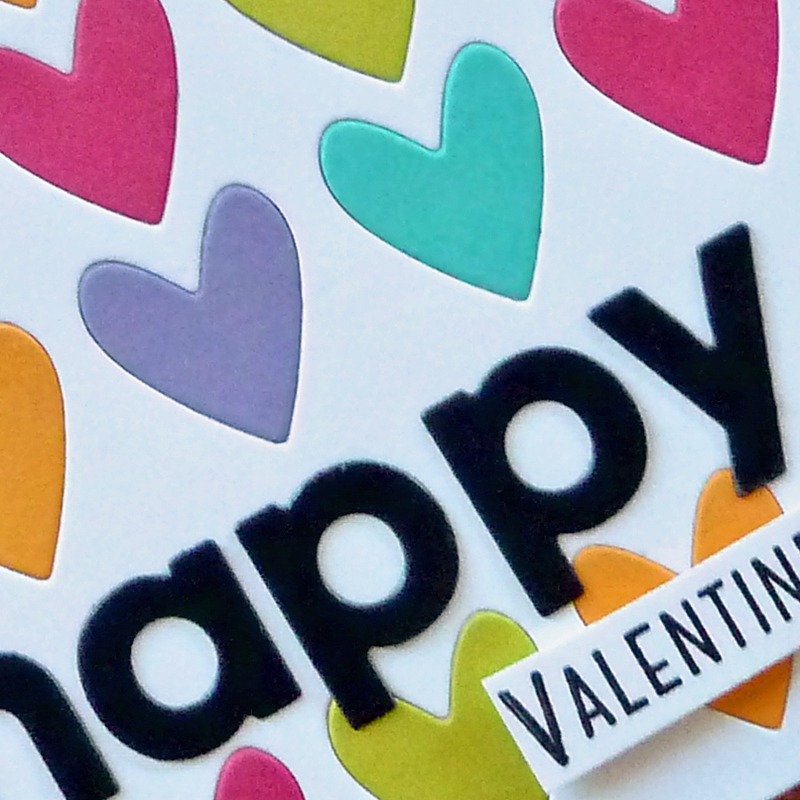 ;) I love the bright hearts and the bold black "happy"! (Did I read somewhere that conversation hearts aren't going to be made anymore? If so, BOO.) And that puppy card - adorable! (We both know a tag-maker that would be all over this!) Thanks for joining the fun at the Sisterhood of Snarky Stampers!